Uber isn’t just killing the taxi industry. Its relentless approach to distribution and scale is also putting a nail in the coffin of app stores. Smart companies like Uber are rewriting the app distribution rulebook. Instead of being a bland icon lost amongst millions of others, they’ve chosen to aggressively accelerate their growth through deep integrations with services that people habitually use. It’s the start of a mass migration from the app store which is set to kill a long broken model for good. The iPhone of 2007 was pretty dull compared to today’s generation of 4G smartphones. Even Steve Jobs said the iPhone’s “killer app is making calls”. Looking back, it’s hard to remember there was no app store or native apps to stock it. But despite that growth the majority of native mobile apps are pretty awful. Search for “buy”, “write”, and “chat” in the iOS App Store and you’ll likely endure a spammy list of irrelevant apps. For a startup launching a new app, it’s pointless noise that comes between you and new users. Today’s solution to getting discovered on app stores is simple: cold hard cash. App installs are bought, not earned. During my time at Facebook, I worked on the roll-out of what is now a multi-billion dollar business: Mobile App Install ads. Advertisers love them because mobile app install ads solve a real problem – discovery – and are a force multiplier which drive installs and usage. Paying for app downloads is clearly better than no app downloads at all. Ads can help your app stand out from the noise. But they’re an expensive fix for a broken model. Instead, reconsider whether you even need to build a native app at all. The most successful companies in the world don’t focus on building apps – they focus on building systems which solve real world problems. Facebook’s iOS app isn’t “Facebook” – it just happens to be one way that customers interact with different elements of the Facebook ecosystem. The app is a means to an end, one of many bridges between Facebook and the user. Facebook is a system of individual components with relationships between them. Apps are just one part of this system. Start with the problem you’re trying to solve, design the system that you think will solve it; the platform choice should be a technicality. Don’t start with apps. Don’t even start with mobile. Don’t be conned into thinking mobile equals native mobile app. Top 10 apps lists like the above are dominated by native apps. Look at the list a little bit closer and you’ll see, aside from Clash of Clans, these apps are focused either on social networking or messaging. They’re communications tools we use every day. In many ways Facebook, Twitter, and WeChat are browsers too – wrappers for the mobile web. Native apps are perfect for these frequent, heavy use jobs. But that doesn’t mean you need a mobile app for every product or service. Ask yourself – will people really want to put your icon on their homescreen? That’s why companies like Uber are looking beyond homescreen icons. Instead of asking users to come to them – download and install an app – they’re deeply embedding their services where users already spend their time. Uber have tapped into the usage habits of Citymapper and its millions of users by embedding Uber estimates within Citymapper itself. You don’t need to have Uber installed to see wait times for a car; the estimates appear within the Citymapper app, updated in realtime. Completing a booking happens in a couple of clicks. Right now the booking process relies on installing the Uber app first, but soon the entire process will happen within Citymapper. No need to download an app. The embedded experience is the app. Citymapper and Uber have well resourced partnership teams to build these integrations, but discovery networks like Button also give developers an easy way to embed their services within others. These integrations are becoming the connective tissue for entire workflows, and a massive distribution opportunity. Contextually relevant, helpful, and embedded – everything the current generation of app stores are not. Uber’s partnership with Facebook takes things to the next level by allowing a car to be summoned from within a conversation. Uber taps into Facebook Messenger’s 800 million users though a very basic bot. Facebook Messenger users can book a ride with Uber in seconds. For new users, an account is automatically created, complete with some starter credit. This happens magically in the background. Updates from Uber appear in real time through Facebook Messenger. There’s no need to download an app. The bot is the app. Much has been made of the decline of Google’s search business over the past couple of years, but its mobile search business is starting to take off. It’s recently made big steps towards driving discovery of mobile services by allowing users to stream mobile apps as cards within search results. Don’t have the app? You don’t need it. Google will serve it up to you over-the-air. This is a bridge towards a world where all search results are cards which interact directly with services in the background. Imagine searching for a hotel room and completing the booking process directly within the search result. This is already happening today, and will become even more powerful when location and usage data comes into play. In the future, Google will recommend new services to users before they even know they need them. And those users will interact with and transact with those services through cards, not bloated apps. Cards, not apps. The card is the app. Ecommerce platform Tictail is pioneering the use of contextual suggestions. One of their most unique features is a “feed” which suggests helpful actions a merchant may need to take based on signals, such as yesterday’s sales volumes. Built into this feed is a recommendation engine which surfaces potentially useful Tictail apps. 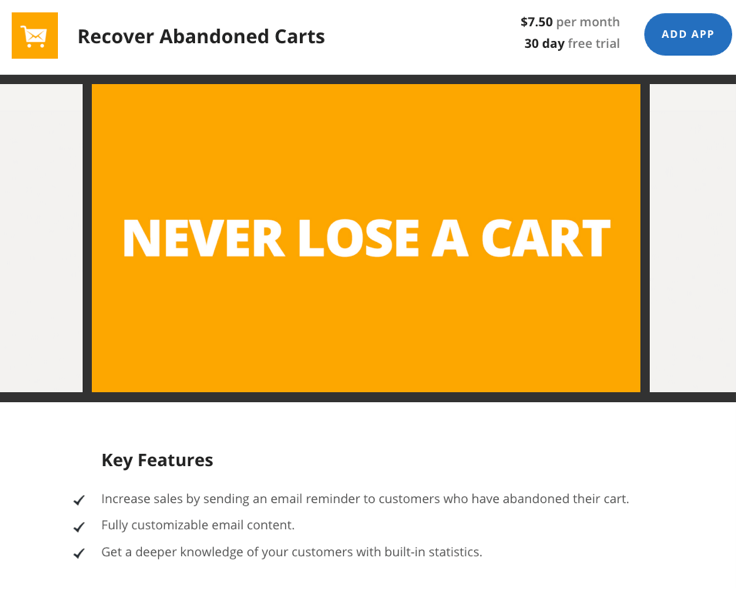 For example, a store which had five “add to cart” actions yesterday – but no checkouts -might be automatically recommended the “Recover abandoned carts” app. This is app discovery at it’s best – helpful, timely, and frictionless. Context and behaviour suggests the app. These new discovery channels show up today’s app stores for what they really are – a bloated, noisy relic from a time when apps were the only way to get the most from early smartphones. App stores are a payment gateway, and nothing more. Deep integrations and contextual relevancy are the new distribution opportunity. They provide a better experience for users and businesses alike. Together, they’re the app store killer.